Below is a roundup of the leaked videos detailing the features of Moto X, including the promo for Rogers, which we showed you already, and was afterwards taken down. It will be the exclusive carrier for the handset up north. The narrator says Moto X will be hitting Canadian shelves in August, so we'd assume the same here in the US. The ad also touts the always-on environmental awareness of the handset that listens and answers to you all the time, not only in unlocked state. Next in line is a CPU review using the GSM version for AT&T, that already was leaked out, and subsequently pulled, too. It indicates the same Motorola X8 processor found in the new DROID trio, tailored specifically for the always-on functionality, and based on Qualcomm's Snapdragon line Krait cores and Adreno GPU, as the test app shows. The second vid also higlights the funky new logo and boot animation. Another hands-on video has emerged from Vietnam in the meantime, giving us a tour of the design and interface, so dig into the slideshow below and tell us if you are already trembling with impatience for tomorrow's official announcement, We'll be there to report all the juicy Moto X details. Promo videos for Rogers, which says the handset will be hitting Canadian shelves in August, so we'd assume the same for US. The ad also touts the always-on environmental awareness of the handset that listens and answers to you all the time, not only in unlocked state. CPU review using the GSM version for AT&T, indicating the same Motorola X8 processor found in the new DROID trio, tailored specifically for the always-on functionality, but based on Qualcomm's Snapdragon line Krait cores and Adreno GPU. The second vid also shows the funky new logo and boot animation. the woman in the ad kinda reminds me of the woman who represents PS3, in the ps3 versus wii ad way back in the day. My question is why would anyone choose her when we could have the the wii woman? Its the complete opposite now lol, nobody wants a wii u and everybody wants a PS4/ Gaming PC. That's one highly reflective screen !! what the hell is this youku video player ??! !, quality is sh*t and I can't change it because I don't know Chinese -_-, PhoneArena please post videos from Youtube. Right? i havn't owned a motorola phone EVER (and i mean ever, not even a flip)...But I'm pretty sure (we'll see tomorrow) that this will be my next device. Crazy for me to say! 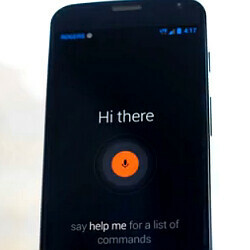 Finally we meet Google now's wife. Still can't wait till tomorrow. and please stop posting videos from a few weeks ago. I WANT THE REAL HANDS ON DEMO PLEASE.